The PEM-1000 emission microscope incorporates the latest technology in real time, high quantum efficiency, mega-pixel CCD detectors in a back-thinned cooled camera. A portable system, the PEM 1000 can interface with all analytical probe stations, ATE (automated test equipment) and bench top configurations for high speed functional testing. 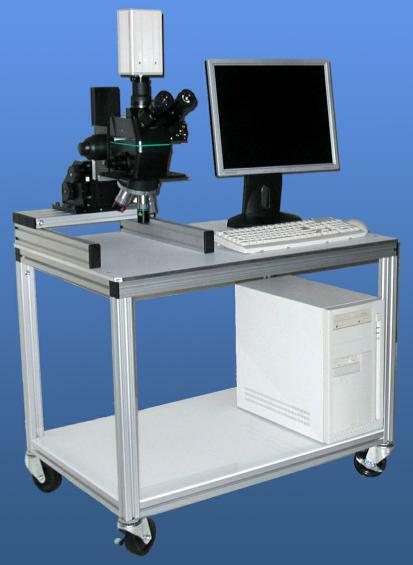 The compact and lightweight modular design allows unlimited configurations for both packaged device and wafer level testing for front and backside emission microscopy applications. 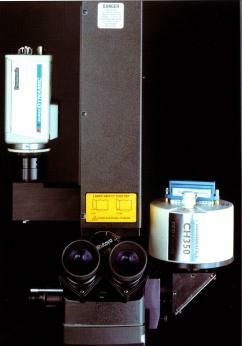 An extensive range of photon emitting defects can be easily detected and analyzed with PEM 1000 emission microscopes. Provides manual slide prism out of optical path for increased microscope sensitivity, with a wide range of objective lenses. 2X, 5X, 20X, 50X, and 100X magnification are available. 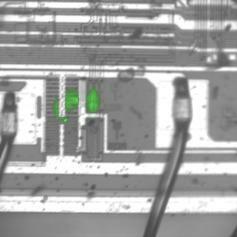 The PEM 1000's back-thinned, CCD-cooled digital camera provides low-noise, high-resolution NIR images. 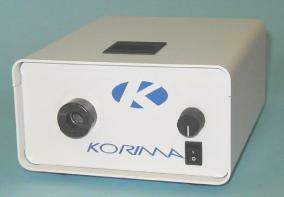 Korima's PhotonView is incorporated into the PEM1000 Emission Microscopes provides the utmost ease of use for the FA engineer for device positioning, emission detection, and data management. Overlay emission(s) and DUT images on one color channel corrected image for optimal display. Image enhancement functions such as digital zoom, annotations, filters, and background color selection allow quick display optimization. An exclusive range of image archiving file (or session) output options allow easy importation of images into desktop publishing programs for report generation. Available as a standalone unit or in an upgrade kit, the Korima PEM-1000 series combines an exclusive laser marking system with state-of-the-art computer image processing and night vision technologies. On the PEM-1000 screen, photons emitted from defect locations appear as bright spots, superimposed on the D.U.T. image at the same magnification. The image can be observed directly from the screen, or recorded to create a continuous action record. Pictures can also be stored on disk for further analysis in common image formats, such as TIF, BMP, and others. Objective lenses: 5X, 10X, 50X, 100X (all NR class). 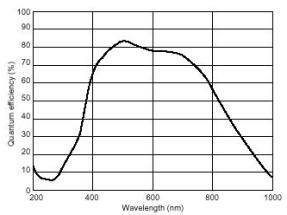 Click here to view PEM-1000 sample configurations. Click here to download PEM-1000 product information.